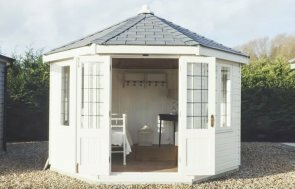 High-Quality Octagonal Summerhouses | Delivery & Installation Incl. 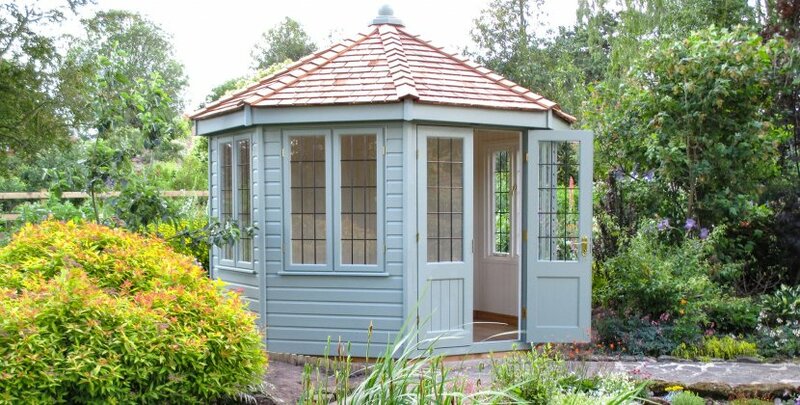 A spacious octagonal den in a timeless design with multiple window sets, and a lofty ceiling work together to complement this beautiful classic. The interior affords for a very sociable circular seating arrangement, perfect for dining with friends or creating a relaxing space in your garden, all finished to our very highest standards. 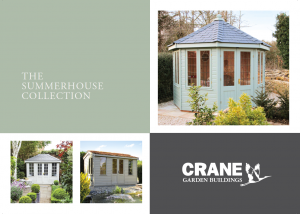 To create your own ideal Summerhouse, please click on the Create My Summerhouse tab below. 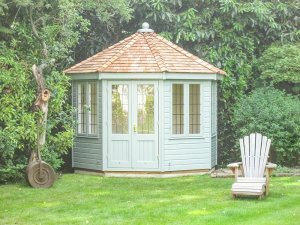 To afford a light and airy feel inside your Wiveton, and with its octagonal shape, there are windows in four out of the eight sides, as well as in the double doors. 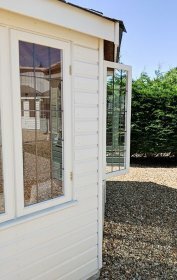 The windows are all made from 4mm toughened safety glass, they are all opening, and are finished with polished brass or chrome furniture and fitted with draught excluders. You can also choose to have double glazing. 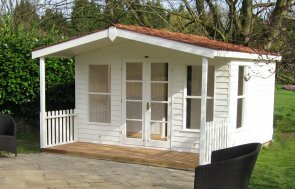 The Wiveton Summerhouse comes lined and insulated (walls and ceiling). 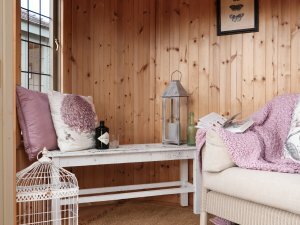 This makes it a perfect all-season retreat and greatly enhances the finished look of the building, increasing comfort and decreasing noise levels. 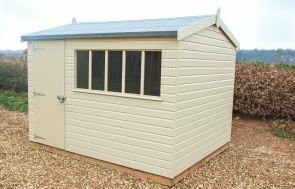 Side Walls - ex 19 x 125mm shiplap or weatherboard cladding on ex 38 x 75mm planed framing, all using high quality northern Scandinavian Redwood. The walls are lined with a breathable paper membrane and insulated, before being internally clad with ex 19mm vertical tongue and groove matchboarding with a choice of a painted or natural finish. Doors - 1 pair or joinery-made double doors 1830mm high x 1100mm wide, 3/4 glazed with 4mm toughened safety glass. The doors are fitted with a mortise lock and either polished brass or chrome handles. 4mm toughened safety glass. The window frames are joinery-made, and they are finished with either polished brass or chrome fittings. 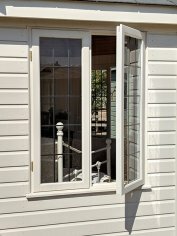 You can also choose double glazing. Floor - ex 19 x 125mm tongue and groove floorboards on ex 38 x 75mm tanalised, planed floor joists set at no less than 450mm centres. We also offer the option of having a heavy duty floor, which comprises ex 38mm thick floorboards, and engineered flooring in a choice of four colours. Roof - ex 19 x 125mm tongue and groove matchboarding on solid timber rafters, insulated and finished externally in either cedar shingle or slate effect tiles. Electric pack - This consists of 4 double 13 amp switched MK sockets, a gang light switch, a waterproof double external 13 amp MK socket, an 8 way consumer unit: the main switch takes 2 slots - 63 amp MCB - 16 amp and 6 amp blanks, spotlight sets are fixed into the ceiling of all our Wiveton summerhouses, and there is also the option of having a thermostatic 2kva wall heater. Looking for a Chalet style? 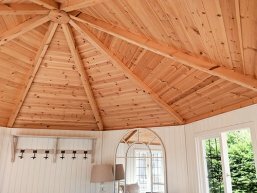 Want a different roof shape?